Chemical equipment. 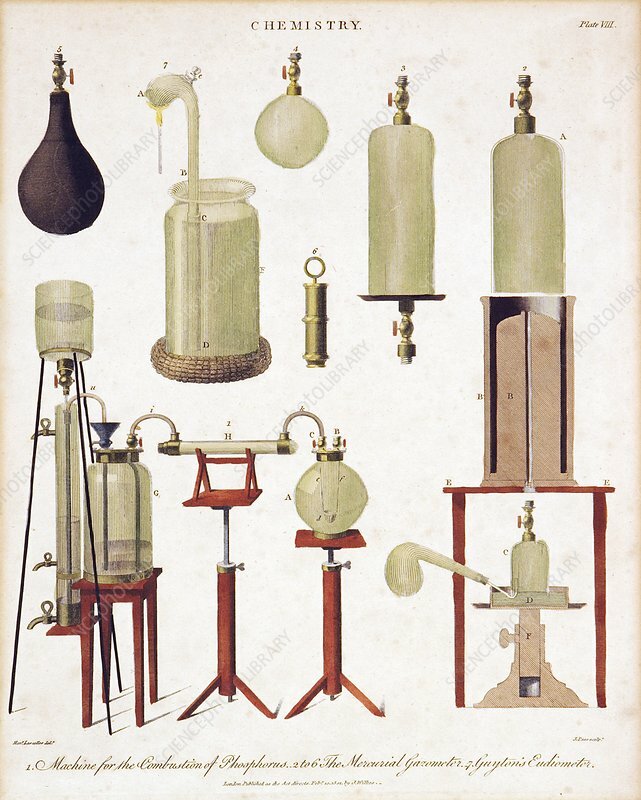 Early 19th-century artwork depicting a variety of devices and instruments used in chemistry experiments. At lower left (labelled 1) is an apparatus for the combustion of phosphorus. Above this (labelled 7) is a eudiometer (Guyton's Eudiometer). Labelled 2 to 6 are parts of the device at right, a mercurial gazometer. Gazometers are devices used to contain gases. A eudiometer is used to measure the changes in volume of gases. This is Plate VIII of a series on modern chemical apparatus published in London in 1801 for the 'Encyclopaedia Londinensis, or Universal Dictionary of Arts, Sciences, and Literature'.